I promised myself that, here in Italy, I wouldn’t write about Israel. It’s too sensitive. Readers are prone to getting bent out of shape, no matter what is said, and I am prone to being sentimental. It’s an explosive combination. Only here, in Perugia, I’ve realized that “the conflict” and my career face similar challenges. We feel, Israelis, Palestinians, and young journalists alike, that our future livelihood depends on the image of ourselves we craft for a global audience. We must make ourselves into a living attraction, in order to survive. 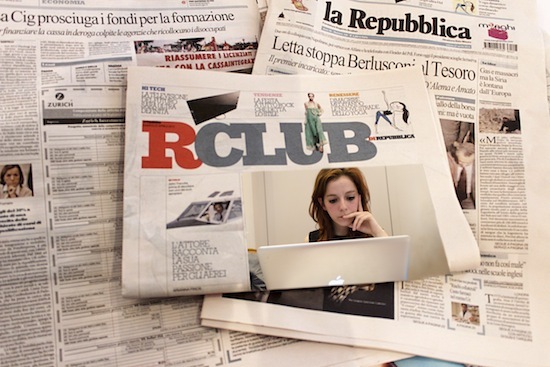 Journalism is shifting from brands and institutions to a business of individual journalists, buzzing around the web. We must craft an online identity, earn the trust of distant viewers. Then, with that reputation, newcomers are supposed to accomplish the work that whole groups and organizations often fail to achieve: dynamic, thorough yet simple, reliable and interactive news. We are expected to do this alone, while everyone watches. Journalists are now expected to research, write, fact-check, edit, record, produce, broadcast, publish and promote our work, in exchange for a pittance, all while engaging our audience and adhering to the same professional standards that entire staffs and networks uphold today. Traditional news organizations offer journalists more than financial support, resources, mentorship and division of labor. They also offer protection, a shield between the audience and the reporter. Mistakes and controversies are absorbed by the institution, so journalists are free to seek truth without the distractions of voyeurism and self-interest. When we are part of a staff, journalists are conduits and not subjects. This new market makes journalists financially and professionally vulnerable. We ourselves become the product, rather than our work. We become like fashion models. Am I ready to offer myself up on a plate, in exchange for the privilege of sharing untold stories? In the case of Israelis and Palestinians, we have an equally enigmatic challenge. We are expected to make peace in a region that has always been riddled with conflict, in an era when international politics are more complex, and weapons are more devastating and widely available, than they have ever been before. Also like young journalists, Israelis and Palestinians, are expected to achieve this lofty goal in relative isolation. Our neighbors are not in any position to offer support or ease the transition. Within our own communities, we are deeply conflicted. In a frantic bid for recognition and support from the “international community,” opposing sides rush to the headlines, battling each other’s narratives. Whoever wins legitimacy will be granted a sustainable model of existence. The loser is demonized and labeled with pejorative terms. These narratives often have a victim and a perpetrator. They rarely acknowledge that most Israelis and Palestinians are both, sometimes in the same moment, sometimes our roles oscillate according to the circumstance. Context is everything. We are human beings, not human doings. A terrorist is also a sibling, a friend, a lover, a son or daughter, a shopper, a joke-teller, a reader and a dreamer. An Israeli soldier, including one with extreme ideals and a violent past, cannot be solely defined by this role. No person can be reduced to a single word, not even a journalist. Although veteran journalists advise us to build a reputation online, the Internet does not come in clean, safe boxes. For young journalists, so much more than our professional work is available online. We grew up on the Internet. Will readers consider my old student blogs, or my cousin’s Facebook pictures, as part of that reputation? Perhaps, reading an article or a column can make a reader feel like he knows me. But I am not the words I once wrote. The reader can only see a flat outline, edited down to its bare bones in the hope of finding objectivity and cohesion, which real life often lacks. The reader views this vague shadow of me, only through the filter of the organization that commissioned the reportage. The reader does not know which choices in the piece were mine and which were made by the publication. Even a blog post I wrote and edited on my own, is only a moment in time. As time passes, my opinions change, my perspective evolves. My capabilities increase. The Internet is written in ink, the blog post frozen in time, while I keep living. Using the Internet to gain the trust of strangers I will never meet, feels like an impossible task, almost as impossible as deciding how separate states in the Holy Land could share Jerusalem. As we stumble into the future, in front of the world, we can only hope that those watching will remember our humanity. At least in my situation, I cannot take a stance with clear borders. There are none. As a journalist and as an ethical citizen, I can criticize the Israeli military. But when I run to a bomb shelter and hear the rockets exploding in the air, instead of on the ground where I live, I am compelled to feel gratitude for an institution I disagree with. If I write about that experience, am I contradicting the identity of my brand: the critical, objective journalist? When someone I love puts on that uniform, a fat black gun strapped across his body, his sleeping bag nestled in the swoop between tiny hills, maybe the words are the same that I use at work, the nouns and verbs, places and actions. But each word takes on a new meaning when I talk to him about his military service. Reserve duty becomes like a part of our annual seasons. There is spring, summer, winter and war. Unlike my articles, which have defined characters, a concrete beginning, middle and end, I cannot promise the Internet audience that I will fit into a category. As a young journalist, I must market myself as a product, a brand. But I can’t sell my identity as a ‘post-Zionist this’ or a ‘pro-Israel that.’ I can’t even promise readers I will always be a reporter in Israel. Maybe someday I will move, the way I have always dreamed of, to a Spanish-speaking country to improve my fluency. How can a young journalist market her or himself, while still remaining open to change and new opportunities? Will readers be able to trust me, will I be able to attract readers at all, if I don’t turn myself into a flat character, familiar and easy to comprehend? This is the same dilemma we face as citizens of the Holy Land. How can we tell our story without reducing our multidimensional lives to words and static images? I haven’t figured out what my marketing niche will be, since today that is a necessity in this industry. I don’t know how I will promote myself while remaining true to the complex and evolving reality around me. For now, all I can do is promise to remember that we are all human, both writers and our subjects.